The multi-million pound initiative was launched after the United States decided to withdraw from the United Nations’ Paris Climate Agreement. 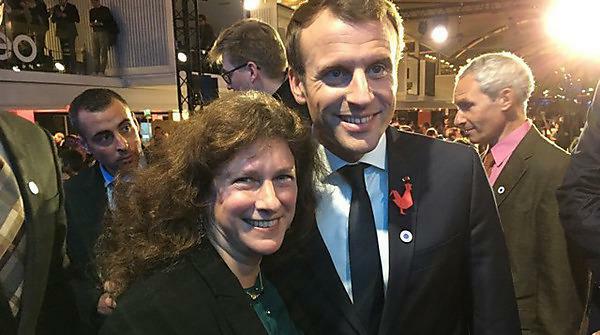 Its first 18 recipients were announced ahead of the One Planet Summit in Paris on December 12, with Professor Parmesan one of those chosen from more than 1,800 applications. She has been an academic in Plymouth for nearly seven years, as well as holding positions at the University of Texas, but will now also get the opportunity to work at the Station for Theoretical and Experimental Ecology at Moulis in the Pyrenees. Her research there will focus on the impacts of anthropogenic climate change on wild species, and its conservation and societal consequences. This will include exploring changes in human disease risk as a consequence of the range shifts of disease organisms, and assessing climate change risks for species inhabiting mountainous and boreal regions. "It is a great honour to be part of this programme, and be named alongside many exceptional people from the world of climate research. The experimental facilities at Moulis are amazing, and will give me a unique opportunity to further my research into environmental and societal change. I have collaborated with scientists across Europe over many years and am excited about the potential to enhance the links between France and Plymouth in the future." This is the latest international accolade for Professor Parmesan, who was an named official Contributor to the Intergovernmental Panel on Climate Change (IPCC) when it received the Nobel Peace Prize in 2007. She has also received the National Wildlife Federation’s Conservation Achievement Award in Science, was named the Outstanding Woman Working on Climate Change by the International Union for Conservation of Nature, and was featured in the Who’s Who of Women and the Environment by the United Nations Environment Program. The vast majority of the “Make Our Planet Great Again” award recipients currently have links to the US, but also include researchers from Canada, India, Italy, Poland and Spain. "This is outstanding news for both Camille and Plymouth, and confirms her place as a leading international researcher into the effects of climate change. It will enable her to pursue new ideas around its impacts on human and animal populations, while exploring the varied ways her work can be adopted by international policy makers."